TSPSC Telanagana Para Medical Posts Recruitment 2017: Telangana State Public Service Commission: Hyderabad issued Notification No. 58/2017,Dt. 08/11/2017 to direct recruitment of Physiotherapists Recruitment in Telangana Vaidya Vidhana Parishad. 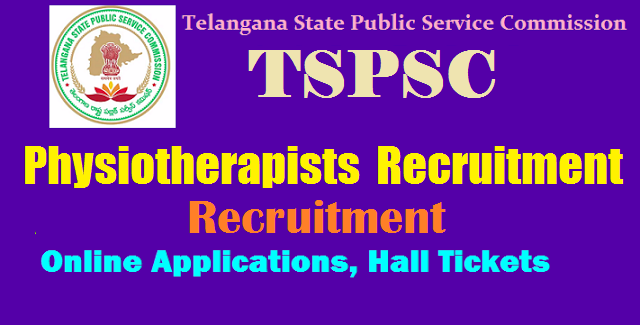 Applications are invited Online from qualified candidates through the proforma Application to be made available on Commission’s WEBSITE (www.tspsc.gov.in) to the post of Physiotherapists Recruitment in the State of Telangana. The submission of online application is from 16-11-2017 and last date for submission of application is 11-12-2017 the details like TSPSC Physiotherapists Posts Online application form, how to apply, hall tickets, Answer Key, Selection list Results, Exam pattern, Selection procedure for TSPSC Paramedical staff, ANM, Lab Technician, Staff Nurses, Pharmacists and other posts 2017 and more details are given below. No.Of Vacancy : 06 Posts. If candidates with BPT are not available for recruitment then candidates with BA/B.Sc/B.Com or its equivalent graduate examination recognized by the Govt. and with training in electro-therapy or physio-therapy or physical Training with special preference to massaging for atleast two years from a Govt. recognized institution shall be considered.